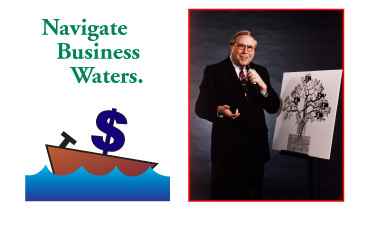 Hank Moore's "The Business Tree"
Big Picture business perspective, customized to industries. Handouts-workbooks on every dynamic of business. Did you ever wonder where the most successful corporations get their ideas for future growth? 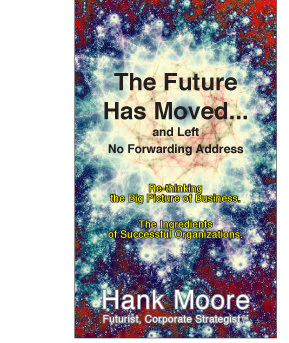 They are coming from Hank Moore, internationally known business advisor, speaker and author. He has presented Think Tanks for five U.S. Presidents. 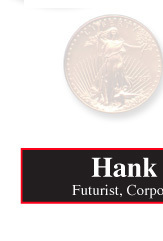 Hank Moore is a Futurist and Corporate Strategist™, with his trademarked concept, The Business Tree™. Hank conducts independent performance reviews, Strategic Planning, Visioning and growth strategies for organizations of all sizes. He conducts Executive Think Tanks…the result being the companies’ destinies being charted. His client list includes more than 2,000...including 90 of the Fortune 500 companies and many public sector entities. He advises at the Executive Committee and board levels, providing Big Picture ideas. As a Corporate Strategist™, he works with boards of directors, CEOs and executive teams of corporations...guiding them toward a profitable Vision and increased shareholder value. He facilitates decision-maker ”think tanks“ based purely upon his own ideas and creative concepts. Hank Moore was a White House advisor to President Lyndon Johnson, serving as one of the authors of the Civil Rights Act of 1964 and the first trade-with-Mexico bill. He also advised President George Bush, as one of the architects of the Thousand Points of Light program for volunteerism and community stewardship. He has won more than 150 awards for client work and community stewardship. He has been inducted into two professional halls of fame. He is that rare 1 out of 100,000 senior business advisors, a Big Picture strategist, with original, cutting-edge ideas for creating, implementing and sustaining corporate growth throughout every sector of the organization. 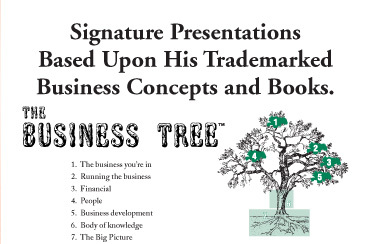 His Business Tree™ is a trademarked approach to growing, strengthening and evolving business, while mastering change. 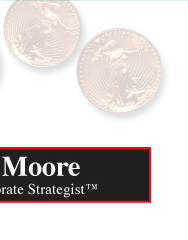 Hank Moore has published more than 250 articles and monographs in business publications, journals and consumer magazines and has written five books: The Business Tree™, The High Cost of Doing Nothing™, Pop Culture Wisdom, The Classic TV Reference and It's Almost Tomorrow™. Four more books are in production: Secrets of the CEOs, The Children’s Tree™, Confluence™ and The Book of Words. Big Picture Business Issues: The Business Tree™, analyzing the 7 parts-components of a successful company. How to conduct Strategic Planning and Visioning processes. Corporate Visioning: The High Cost of Doing Nothing™, why good companies go bad and how to improve them. Crisis Management and Preparedness: Achieving the Best by Preparing for the Worst. Predicting and surviving any kind of crisis. Case studies, pointers and methodologies to pre-empt company damage. Futurism: It’s Almost Tomorrow™. Benefiting from trends in business, organizational transformation, capturing and building shared Vision. Executive Think Tanks: Secrets of the CEOs...Pop Culture Wisdom™. Leadership Development Institutes--Mentorship: The Learning Tree™, The Organization Tree™. Change Management: Trees in the Forest™. Distinguishing your company from the pack and move to new levels. Amfac • Aramco • ARA Living Centers • ARCO Chemical • Associated General Contractors • AT&T • Barnes & Noble • Baskin-Robbins • Bayer-Miles Laboratories • Bramalea Ltd. • Burlington Resources • Campbell Soup • Century 21 • Charter Hospitals • Chase Bank • Chevron • Coca-Cola • Concession Air • Container Service Corp. • Cooper Industries • Coors Beer • Cyclops Corp. • Dayton Hudson • Dean Witter Reynolds • Disney • Dow Corning • Dowell Schlumberger • Dupont • Eli Lilly • Emett & Chandler • Ethyl Corp. • L.B. Foster • F.T.D. • Genentech • General Dynamics • General Instrument • General Mills • GTE • Halliburton • HCA • Health Economics Corp. • Hewlett-Packard • Hormel • Hydril • IMAX Camera Corporation • Italian Trade Commission • Johnson & Johnson • S.C. Johnson • Kentucky Fried Chicken • Kraft-General Foods • Lloyd's Bank • Marriott • Metropolitan Life Insurance • Mobil/Superior Oil • Monsanto • Nutrasweet • NL Industries • Optical Data Corp. • Oshman’s • Paper Group • Pennzoil • Perrier Water • Pfizer • Philip Morris • Pizza Inn • Procter & Gamble • Quaker Oats • Sandoz • Santa Fe Energy Resources • Schering-Plough • Shell Oil • Sheraton Hotels • Sprint • State Farm Insurance • Sysco Food Service • Texaco • Uniroyal • Walden • Wells Fargo Bank • Westin Hotels • The White House • Wyeth Ayerst • Non-profit and public sector organizations • National and state associations • External sponsored conferences for customers-stakeholders. 1. Injecting Big Picture thinking into each aspect of the organization. perspectives into which they belong. 4. Developing and profiting from your own learning curve. 5. Steady progressive growth...outliving shortcuts that don't work. 6. Developing of thinking and reasoning skills throughout the organization. 7. Managing and benefiting from the future...rather than becoming a victim of it. 1. Understanding how and why The Business Tree™ (any organization) stands and grows...instead of looking at each leaf, twig or branch. 2. Inspiring executives to think wholistically about each component of the business in terms of the Big Picture, master change and take companies to new tiers. 3. Fresh approaches toward re-applying past knowledge and experiences. These become Lessons Learned But Not Soon Forgotten. 4. Strategies to reduce The High Cost of Doing Nothing™ ...making business more creative, effective and profitable. All major industries over 40-year career: Construction, Education, Energy, Environmental, Financial, Healthcare, Hospitality, Insurance, Manufacturing, Non-Profit, Professional Associations, Public Sector (government, municipalities), Technology, Utilities. Acronyms • Annual Reports • Association Trends & Management • Board Development • Branding • Budgeting & Planning • Business Trends • Change Management • Community Stewardship • Corporate Communications • Creative Idea Generation • Crisis Management & Preparedness • Customer Service • Diversity • Ethics • Futurism • Growth Strategies • Leadership • Marketplace Strategies • Mergers & Acquisitions • Non-Profit Trends & Management • Oxymorons • Performance Reviews • Pop Culture Wisdom • Professional Development • Quality Management • Re-engineering • Small Business Management • Strategic Planning • Technology • Training • Visioning. —Dino Nicandros, Chairman, Conoco Inc.
Keynote speaker, Executive Think Tank presenter. Big Picture strategic planning, corporate visioning. Independent company studies, performance reviews.